The clean, white, boxy rooms of modern architecture are all very crisp and neat but the reality for the occupants can be that they make for clinical, boring and echoic spaces without much sense of warmth and homeliness. All too often money is spent on plastering which is then covered up. Think long and hard before plastering a kitchen wall before cupboards and splashbacks make that work redundant. Similarly, there is no need to cover up plasterwork with a fitted bookshelf or cupboards especially double sided ones serving a room on the other side. Hey, you might not even build a wall here let alone plaster both sides, just leave a large opening. The Original Twist integrated concrete beam system can make a beautifully lit ceiling with wooden beams and boards …. but what about the walls? You might be wondering how to finish the stack of Durisol blocks you built with. The usual plastering solution needs a certain amount of organisation; the first fix plumbing and wiring has to be done and then the plasterer booked for some slot later. From start to finish it could be at least a couple of weeks before the plaster has dried and been painted. Even then there are many things a plain plastered wall does not deliver, so let’s have a look at the Original Twist concept wall and see what extra benefits can be achieved. Here are some ideas incorporated into one picture – it doesn’t have to be this busy. Basically there are three or four transverse wooden beams fixed to the wall and then panels fit somewhat loosely and quickly onto them. Extra insulation can be particularly easily added at this stage. This top beam has a rebate sawn at the back to allow the top panel to be held in place then dab bonded to the wall or a top batten. Pictured is a strip of plywood with vertical marks scratched to resemble boards; quick and inexpensive. Strip LEDs are then laid on top of and under the beam and hidden behind the pelmet board – an inverted strip of skirting board would be good for this. Note how lovely the panels will look when the lights go on. The next beam down has a similar rebate and here the larger panels are pushed up first to hook under the top beam before dropping into place on the beam below. 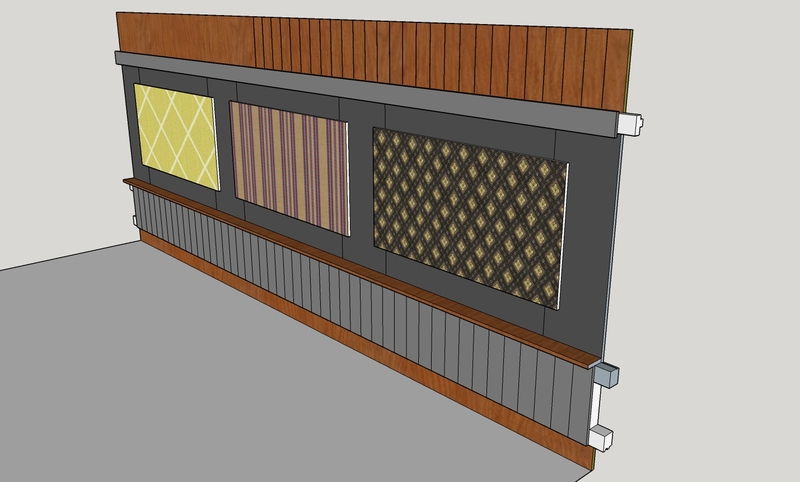 Our top picture shows an example of black ash faced panels with OSB panels fitted on top. The latter can be covered in anything from wallpaper to fabrics and give unlimited scope for decoration; they could even match a TV screen. If engineered floor boards are being used for this section remember that many of them come in 1.2m lengths so designing for that might save a bit of time and not leave any waste. The lowest section takes on a colonial look with tongue and groove boards under a shelf. The point of this is that wires and pipes can be hidden as can tubes for integrated dust extraction. Fan coil units for heating and air-conditioning can be fitted into this space with the inlet and outlet vents facing down and hidden. If possible the height of this section should be like kitchen cupboards so that doors and hinges can be incorporated and some mini cupboards too. The underside of the lowest beam has a routed slot for another LED strip light which will highlight the lower panel which acts like a deep skirting board. So there we have it; loads of character, good sound absorption, sensational lighting, lots of utility and all quite easily done by any DIYer. Internal walls in blockwork can be visually tied in by using the same beams but leaving the blockwork as the finish. Blocks can be painted in different shades before they are laid to make an interesting textured look. Any other wall incorporating a fireplace can be made in exposed brickwork to give a structural element with exposed brickwork on the reverse side. By the time all the remaining areas are covered by glass doors and a bit of wood panelling there may be very little plastering to be done at all. For another example of sensible thinking, this time on heating systems, have a look here. You really should get this right and there are many wrong turns where multiple energy sources are integrated.